This floral notecard is easily done with any embossing folder. I gently ran the ink pad over the raised portion of the embossed paper. I embellished with die cuts and a flower. As a way to honor my Mom on Mother’s Day. For shadowing my die cut, I cut the die twice. Once in black and once in white. I applied double sided tape to the back side of the black image and then offset it when I layered it on top of the white image. I embellished the die cuts with 3 small pink roses. I left the right side of my die cut unattached in case I want to use it as a pocket for my sentiment later. I might use this as a wedding card, I haven’t decided yet. As always, share your sunshine! Using a black tag, I embossed white butterflies onto the background. I layered die cuts and more embossed butterflies to finish the tag. Another way to share your sunshine with others. Tie this onto someones coffee mug in the morning to start their day with a smile. This fun pop up Birthday card is a must have for your card stash. I like to keep extra birthday cards handy. With Summer around the corner, make your cards now so you can enjoy the sunshine. This colorful card screams Spring! The best part of Spring is all of the beautiful colors and flowers. I started my card with a 5 1/2 x 7 1/2″ turquoise base. My green layer measures 5 3/8 x 7 3/8″. My polka dot paper layer measures 5 1/4 x 7 1/4″ and is wrapped with a pink ribbon. I die cut a large oval in a darker turquoise card stock and embossed it with the Darice folder called Polka Dot. I die cut a smaller oval in white card stock using the Decorative Ovals by Spellbinders. I stamped the bunny, sentiment and butterfly from the Happy Spring stamp set by Rubber Cafe and colored them with Spectrum Noir markers. I used GB8,GB10,PP1,DG3,DG4,OR1,LV1,PL2. For my flowers, I stamped the Large Classic Petunia smaller flowers with black Staz On ink. 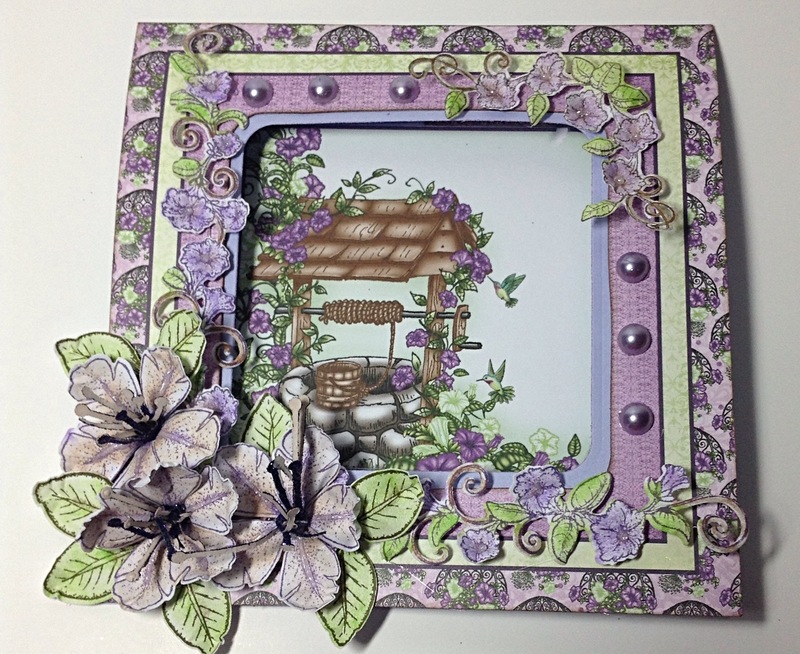 I inked the edges of my Petunia petals Victorian Velvet and the centers with Dusty Concord and Barn Door by Ranger. I shaped the base of the petals with my bone folder and the tips of the petals with my Flowers Shaping Tool kit by Heartfelt Creations. I centered the flowers with white prills. 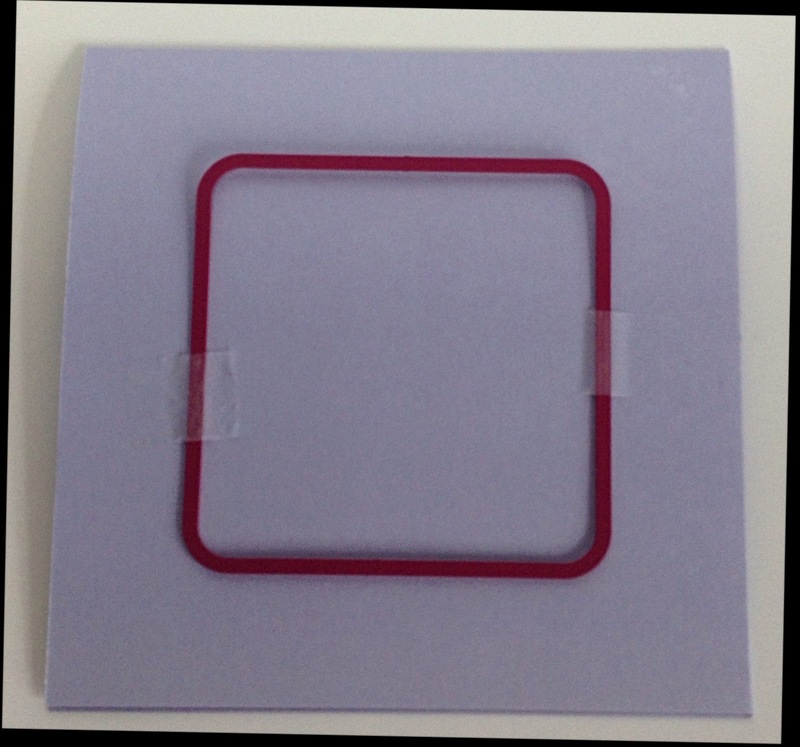 To assemble the card, I used craft foam to layer the focal image. I glued the flowers and leaves to the left of the oval. I accented the flowers with a white Stickles and the oval with pink pearls. This card, or any of your creations, will surely brighten someone’s day. Share your sunshine and creativity with those who need a little “pick me up”. I keep a clip board in my craft room that holds my brainstorming ideas. It was an old clip board that my son had scribbled on years ago. I decided it needed a face lift! 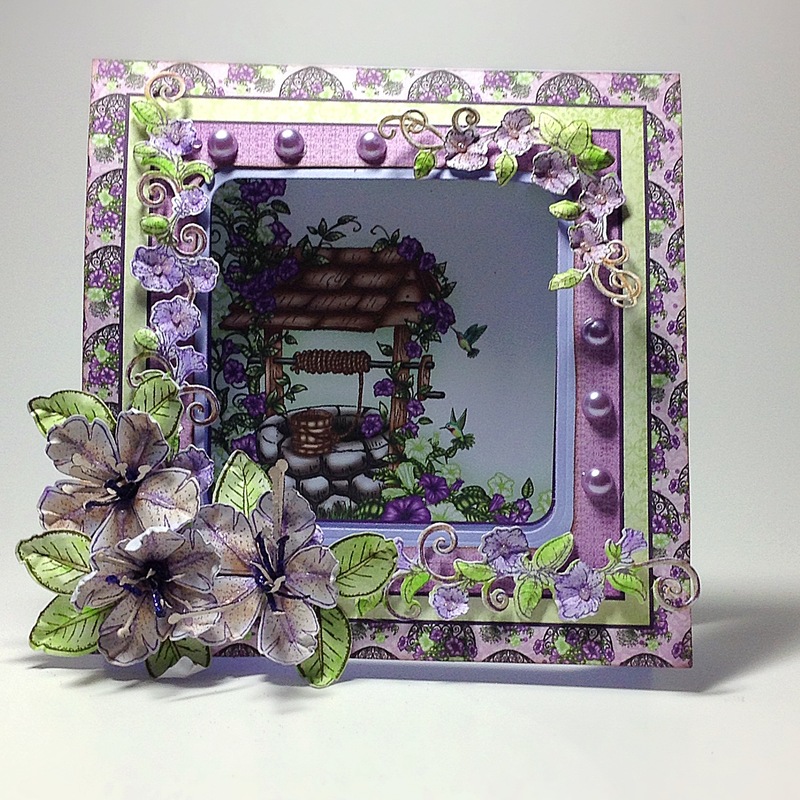 I took the 12 x 12 paper with the wishing well on it from the Classic Petunia Collection by Heartfelt Creations. I attached the paper with Modge Podge to the clip board. I applied a top coat also. I added a small border to the top of the clip board and trimmed the excess with my Exacto knife. I covered the seam with a lilac lace and embellished with pearls. For my floral embellishments, I stamped the Large and Small Petunia Collection flowers with black Staz On ink. I inked the flowers with Purple Passion and Very Berry chalk inks and Barn Door Distress Ink by Ranger. I inked the leaves with Feather Gray and Limeade chalk inks and Cracked Pistacio Distress Ink. For the centers of the flowers, I used white prills. I finished the flowers with a light dusting of Frosted Lace Stickles. I attached the floral vine first to the left side of the clip board and then the different sized flowers. I tucked the leaves in between the flowers. I then attached some flowers to the top part of the clip board to complete my project. 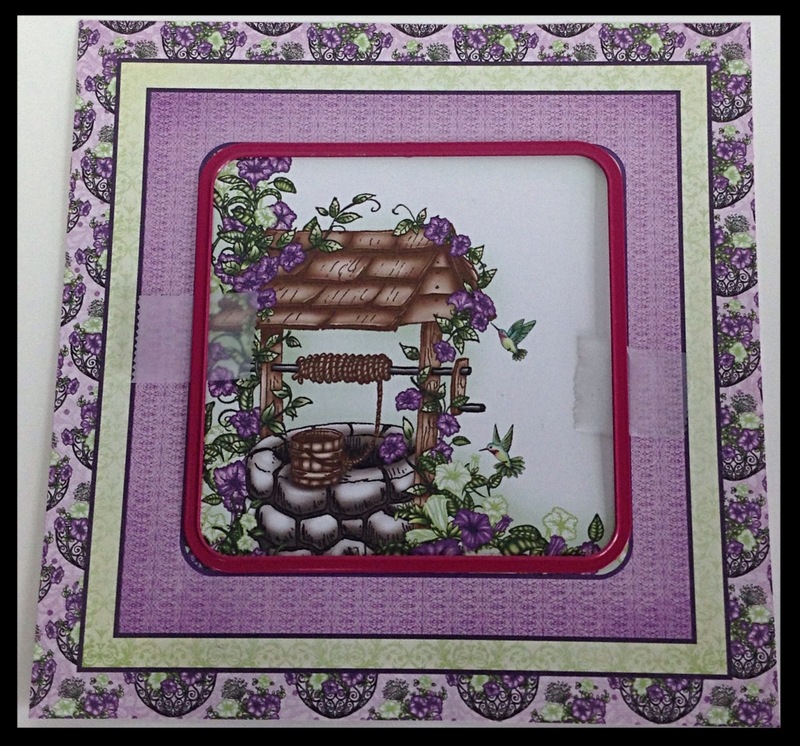 Now my clip board will brighten up my craft room with the beautiful Petunias and Wishing Well. I hope that you will brighten someone’s day and share your hand made treasures! As always, we have a great selection of beautiful images from Heartfelt Creations to chose from for our cards. The Classic Petunia Collection features wishing wells, garden benches, hanging floral baskets, flowers and butterflies. I chose the wishing well for todays card. I started with a 6 x 12″ card stock lavender base. 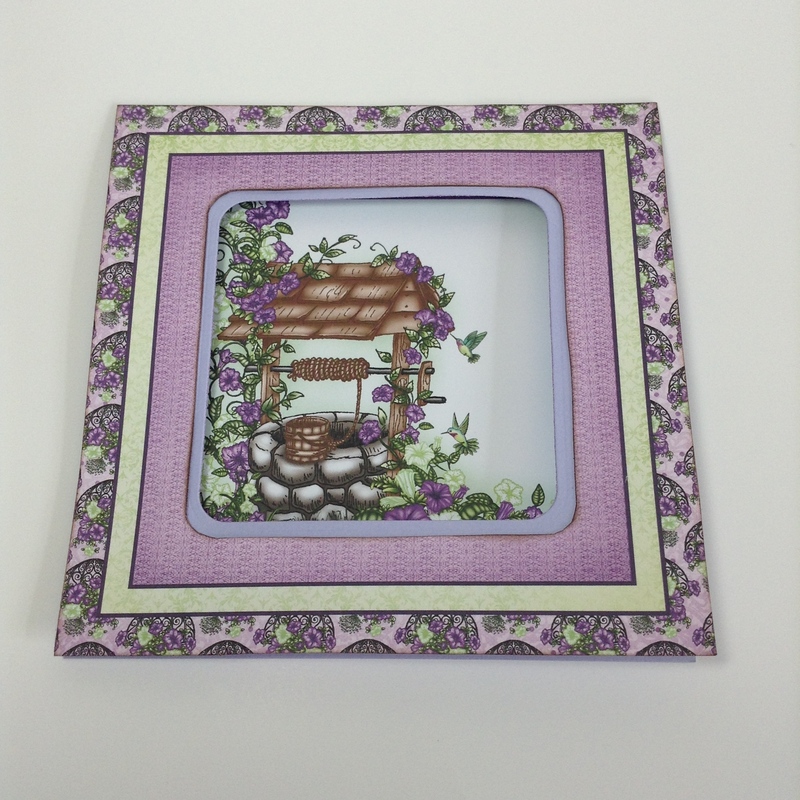 I cut out the 6 x 6 wishing well panel from the paper collection. 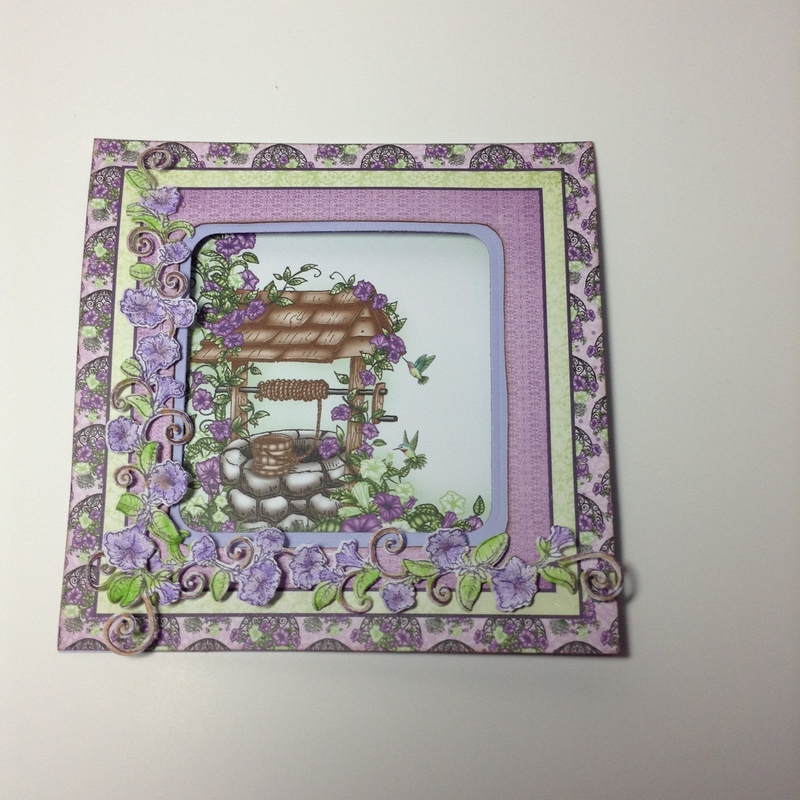 I used the Cut Mat Create 2B die to create my window in the center of the card. To line up the die, I placed my tape on the front of the die and laid it down sticky side up on my image. I then placed my card base over it to attach the die exactly where I needed it. I decided to use my Exacto knife to cut out the center of the panel. The die would have cut on the inside of the border and I wanted to keep the border around the image. I attached the panel to the outside of the base and the image to the inside of my card so that it showed through the window. For my decorations, I stamped the spray of flowers from the Large Classic Petunia set in Dusty Concord Distress Ink by Ranger. I inked my flowers with Heliotrope chalk ink, the vines with Copper ink and the leaves with Limeade chalk ink. I misted them and shaped them with my Flower Shaping Tool Kit. I glued them to the left lower corner of the panel. 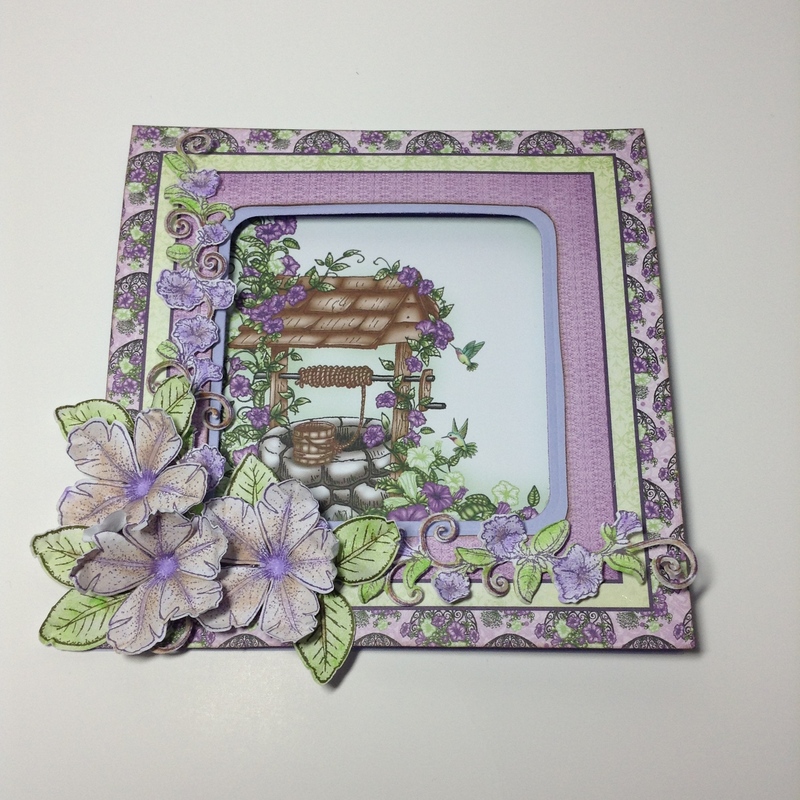 Next, stamp the smaller of the 2 flowers from the Large Classic Petunia set in Dusty Concord Ink. I used the Heliotrope ink to shade the centers of the flowers and the veins of each petal. I shaded the rest of the petals with Dry Sand chalk ink. The leaves I stamped with Forest Moss Distress Ink and shaded them with Copper and Limeade. I shaped them and attached them on top of the flower sprays in the corner. I thought the right upper corner needed a little something so I stamped the flower spray from the Classic Petunia Bouquet in Brown Staz On. I inked the flowers with Heliotrope, vines with Copper and the leaves with Limeade. For the stamens of the large Petunias, I took a piece of light taupe card stock scrap paper and applied DS tape to one side. I die cut the large and small stamens. When you remove the backing of the DS tape, apply purple glitter to the sticky surface. Create the stamens and glue the ends. (I use a quilling tool to shape my stamens. But you can roll them by hand also) Position and glue them to the center of your flowers. I finished off the card with some white glitter accents and lavender pearls. As always, share your sunshine and creativity with others. A gift is meant to be shared!